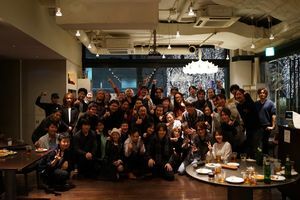 Masahiro Sakurai at a gathering of many musicians whose arrangements were featured in Super Smash Bros. Ultimate. The following is a list of composers who have composed, arranged, and remixed music for the Super Smash Bros. series. The Battle at the Summit! Takahiro Nishi Dialga / Palkia Battle at Spear Pillar! Yusuke Kudo Free the Spirit! For unspecified reasons, Asuka Ito was never credited on the Super Smash Bros. for Nintendo 3DS / Wii U official website's composers list. This page was last edited on April 21, 2019, at 00:53.